You might be wondering why I own so much Colgate stock when I don't even buy Colgate toothpaste. Or any toothpaste for that matter. Doesn't that go against one of the top rules of investing to only buy stock in companies whose products you like and believe in? But in this case, it's not about what I believe or encourage others to believe that matters. It only matters what most people believe. I will never use toothpaste again. I know it's stupid. But as long as most people believe that toothpaste is required for healthy teeth, they will use it, buy more when it runs out, and I will profit off of their ignorance. My dividend is safe as long as they don't get it. My dividend is safe as long as they keep blindly believing these "expert" authority figures that advise them to use toothpaste. My dividend is safe as long as they don't think for themselves. If they did, hooo boy. My portfolio would be in all kinds of trouble. There are many other companies in my portfolio whose products I would never recommend you to use. In fact, I believe that a great deal of them cause more harm than they do good. WTF? Why would you support companies like that? I'm in the stock market to make money, not to save the world. To be fair, I tell people all the time what I have learned, and why I don't use toothpaste, but most people don't listen to me. They would rather listen to their dentists. Can't blame them for that, though. I am certainly not a dentist. It is not my desire or place to stop people's self-inflicted suffering. They can choose to wake up at any time. I don't see why I shouldn't take advantage of the social situation. 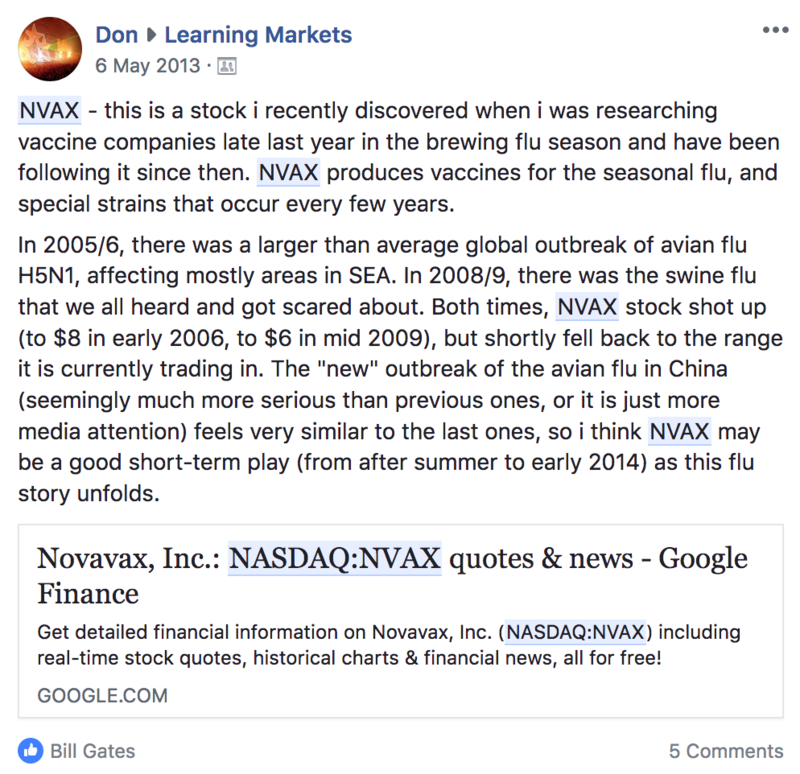 In 2012, I stumbled across NVAX, a company that "creates tomorrow's vaccines today." I put it on my watch list. It piqued my interested because there was a lot of news around Avian Flu spreading fast in Asian countries, how dangerous and deadly it was, and how it could spread and become a worldwide epidemic - and these guys were developing a vaccine for it. Twice before, NVAX seemed to have reacted to news of large outbreaks of the flu. Following news that a massive outbreak may be possible, NVAX shot up like clockwork. I figured that if it had happened so many times before, why not this time? I was making this prediction based only on how I thought people would react to the news about Avian Flu. I knew nothing about the company's financials, leadership, products - all things that an investor should look in to. I was speculating based on how I thought people would react to the news. I mean, check out some of these headlines and exceprts. Sounds kinda scary, right? Uh oh, flu season is upon us. We better start getting our flu shots. Yikes, those are some high numbers in the strain codename. Uh oh, it's starting... I sure hope those experimental vaccines work out. Nice! Looks like the seasonal flu vaccine works after all! Now take a look at the NVAX chart. The horizontal line is May 6, 2013, the day I wrote the post in the Learning Markets group. NVAX closed at 2.16 that day. 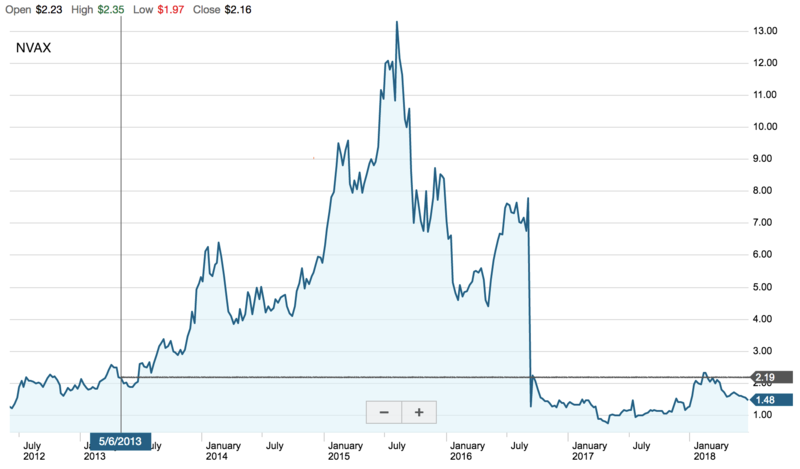 The stock climbed steadily until January 2015, essentially doubling when news of an outbreak in Taiwan started hitting the markets. Then it fell, fell, and kept falling until it was below the post date. Isn't that amazing? It's almost like the price of this things was entirely driven by how people were feeling, or how scared they were about the Avian Flu, instead of rational investment decision-making. But if you ask me to take the vaccine, I would never do it. No way Jose. Merck has done wonderfully as well. What they are doing with Gardasil is ingenious. Essentially, they have been slowly increasing the market size for their best-selling product Gardasil by influencing public health recommendations. When Merck first introduced Gardasil, their target market was limited to adolescent girls who were starting to become sexually active. They lobbied a little bit, and now public health officials recommend that both adolescent girls and boys get the vaccine. This essentially doubled the revenue generation potential for an existing product, meaning no attional R&D spend. Now, Merk is asking the FDA to approve Gardasil for adults as well! Again, this would more than double the potential revenue generation at very little cost to the company. If they can pull it off, that would be amazing. I love this strategy because it goes deep inside the minds of their customers, speaking directly to their greatest fears: their child becoming sick and dying. What sort of careless parent would risk their child's life? And why not get it themselves for additional protection as adults? One thing's for sure. I'm sure as hell not going to my doctor to ask for the world's most popular HPV vaccine, but I will be watching for the FDA's decision in October. Maybe I'll even buy some more MRK before then. It does not matter what I believe. I'm just one person. It does matter what my neighbor believes. It does matter what my friends and colleagues believe. It does matter what you believe. It's not what I believe that will keep sales of toothpaste, Gardasil, or the flu vaccine strong. It's what the masses believe. Of course, I'm doing my part to tell people not to fall for these things that are doing more harm than good, but until they decide to figure it out for themselves, I'm happy being just one of the guys collecting a dividend.